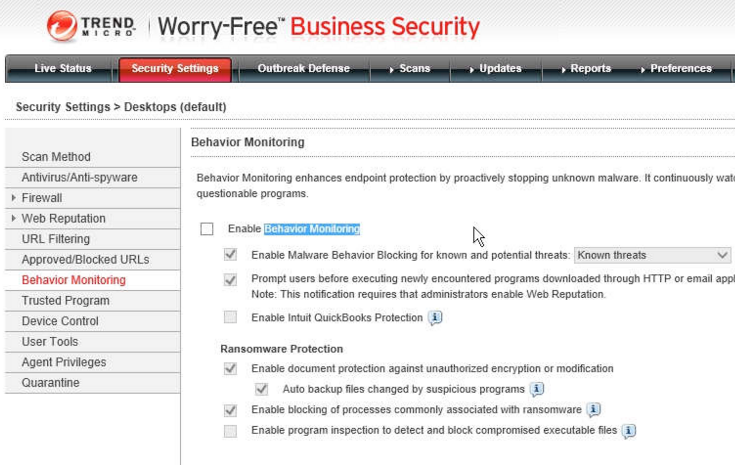 When installing BlackFog with Trend Micro Worry-Free Business Security you will need to disable the behavioral options in the Behavior Monitoring section of their console. Whitelisting appears to have no affect on this solution and it will constantly disable BlackFog from executing, so disabling these options is the best option. Since these options are already handled by BlackFog you are not losing any features by doing this. Please contact Trend Micro directly if you would like these features to be compatible with BlackFog’s functionality.